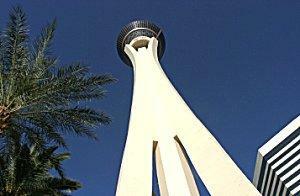 The Stratosphere rides make a trip to this Las Vegas resort far more exhilarating than any trip to a casino. The Stratosphere hotel is the northernmost resort on the famed Las Vegas Strip, and its iconic observation tower is the tallest in the United States. The hotel's more than 2,400 rooms are not located on the tower structure, however, but are found in adjacent hotel towers. The observation tower and its high-flying thrill rides are open both to hotel guests as well as the general public. The resort was completed in 1996, though it has since undergone regular renovations and updates to keep thrilling guests. Because of its location so far from the glittery center of the Strip, the Stratosphere is one of the least expensive of the familiar Las Vegas resorts, making is an excellent choice for families or anyone on a strict budget. It is also favored by guests who enjoy a visit to Fremont Street and the famous overhead light show, since the Stratosphere is equidistant from the center of the Strip and downtown Las Vegas. Just as all mega-resorts undergo renovations and less popular attractions are removed in favor of flashier upgrades, so too have the hotel's rides been upgraded. One of the hotel's first rides, the High Roller, was a favorite Las Vegas roller coaster attraction until it closed in December 2005. The coaster only reached speeds of approximately 30 miles per hour and was suitable for the whole family, but it was removed when the resort decided to upgrade to more daring attractions on top of the observation tower. Today, the rides at the top of the Stratosphere are bold and daring, offering a wide selection of outrageous thrills for interested guests. To ground-level observers, anyone riding Insanity must surely be insane. Riders are strapped into bulky swings attached to an arm that extends 64 feet out from the edge of the observation tower. As the swings rotate, they gradually climb to a dizzying 70 degree angle with an unobstructed view straight down to the street, more than 900 feet away. Spin forces build up to three times the force of gravity. X-Scream is a high-tech, high-rise version of a teeter-totter. The streamlined vehicle has a simple purpose: to propel riders 27 feet over the edge of the tower at nail-biting angles. Riders are then pulled back to safety only to be sent to dangle again and again over the perilous edge. Big Shot has the honor of being the highest thrill ride in the world and is the most popular of the Stratosphere rides. It is a classic launch tower, and riders are propelled upwards at 45 miles per hour with a force nearing four times the force of gravity. While the ride itself may only be 160 feet tall, the total height of the experience atop the Stratosphere tower is more than 1,080 feet, giving the 16 riders an unparalleled view of Las Vegas from the peak. If this trio of thrills is too adventurous, guests can take in milder thrills at the Stratosphere as well. The observation tower is nearly 1,000 feet above the ground, and both indoor and outdoor viewing areas offer spectacular 360 degree panoramas of Las Vegas. Audio tours are available to help guests discern landmarks, and the more than 30 shops at the base of the tower are the perfect place to buy Stratosphere and other Las Vegas souvenirs.